Provides steering input to help keep the vehicle in the middle of a detected lane and provides tactile and visual alerts if the vehicle is detected drifting out of its lane. Important Safety Reminders The LKAS is for your convenience only. It is not a substitute for your vehicle control. The system does not work if you take your hands off the steering wheel or fail to steer the vehicle. Do not place objects on the instrument panel. Objects may reflect on the front windshield and prevent correct detection of the traffic lanes. 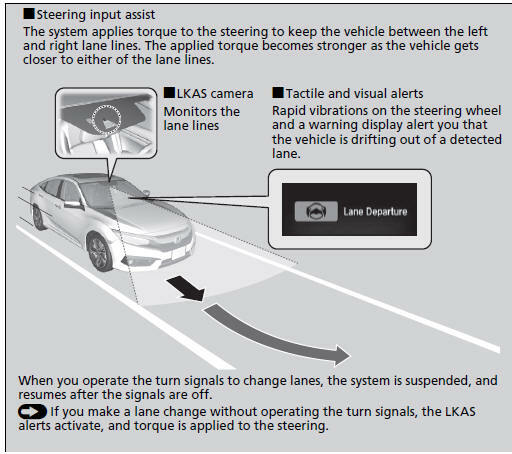 LKAS only alerts you when lane drift is detected without a turn signal in use. The LKAS may not detect all lane markings or lane departures; accuracy will vary based on weather, speed, and lane marker condition.